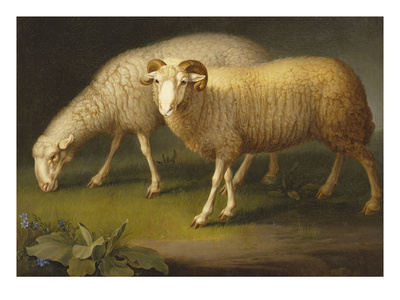 A good friend of mine was a painter and did quite a few paintings of sheep. I wish I had bought one that particularly struck my fancy, but it sold before I could even think about buying it. I'm not the only one who likes sheep. Johann Hofner April 30, 1832 - June 29, 1913 was a painter of animals and farm scenes. 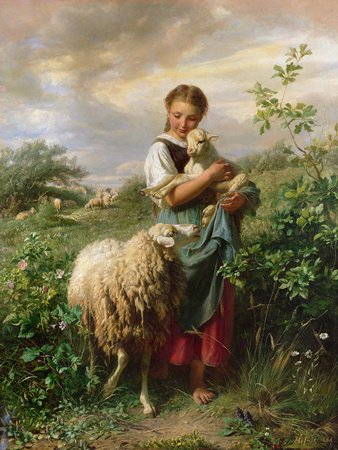 His rendition of the Shepherdess is a very well-known painting. The sheep looks like a few I’ve had and the expression of a ewe concerned about her lamb is all too familiar. 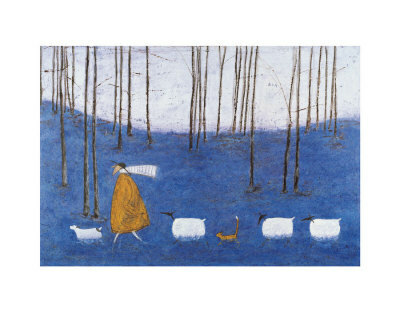 And here’s one with the dog bringing the sheep to the shepherd but being a little distracted by the boys. 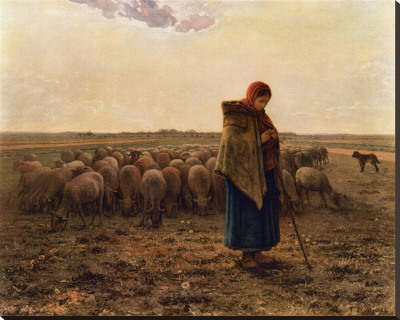 Jean-François Millet was a well-known French painter famous for his paintings of peasant farmers. He started out as a portrait painter but soon returned to his heritage painting famous canvases such as The Sower and the Angelus. His paintings influenced Vincent Van Gogh and Claude Monet. Since he was French, the dog looks less like a border collie and more like some of the French herding breeds. 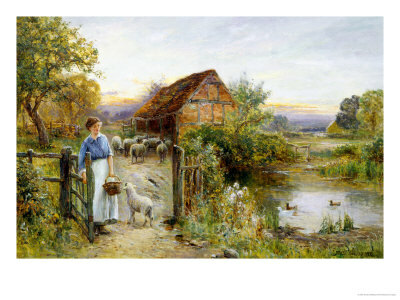 Ernest Charles Walbourn was an English painter of farm scenes. His father also owned land in Australia so it's not surprising that he knew a thing or two about sheep. I’d love to live in some of the cottages he portrayed. This is one I really liked, but wasn't able to find out any thing about the artist. 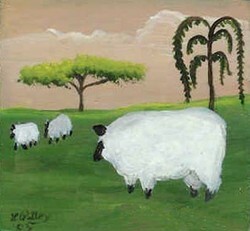 Sheep have always been a favorite subject of folk artists. I have done some myself, But here is a nice one. I was not able to find out anything about this artist either. Another delightful painting by Sam Toft sometimes described as a whimsy prone artist. Her mixed media paintings are sold in galleries in her homeland, the UK , and in the United States. I've done a couple of my own sheep paintings. Nothing like the masters, but I enjoyed the results. 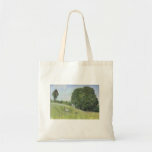 I've put a couple of them up on my new Zazzle store for your viewing pleasure. There's a lot of sheep trials in Canada. I never made it up there but friends of mine did. I love sheep, too. I raised them years ago in Quebec and they still have a special place in my heart. They taught me a lot. Funny. I had a friend who made her living carving chickens out of wood. She really was quite good. And they sold like crazy. Guess you're not alone! I don't find this strange at all. I love chickens. I find it very relaxing and therapuetic to watch them. I have plans for chickens in my Zazzle store. Wow. I should have asked you instead of trying to look it up. 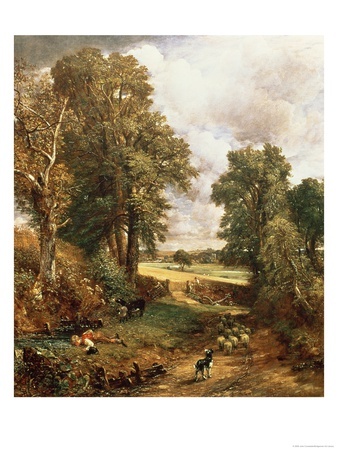 Thanks for all the info on Constable. I personally am drawn to the sheep. She's worried about her babies. I've done the same thing, carrying the lambs away to get mom to come into the barn so they can stay close for a couple of days. Sometimes new mothers won't recognize their own lambs unless you keep them confined for a day or two. Once they bond, they go back out and the ewe knows, without a doubt, which lambs are hers. Pink color is especially popular among girls but this is true for less than hundred years. While it looks like a simple mixture, there are hundreds of known pink tones. Candy Waters is a nonverbal autistic teen. Her parents discovered she has a passion for painting, and have encouraged her to use her art as an outlet for her emotions.